This looks so cool!! Angela sent me this link to Mel's blog and she listed 52 ways to Cuttlebug!! She found a few ideas I had not thought of, and this was one. Glue aluminum foil to a piece of cardstock and cuttle it. I took it a step further and stamped on it with Stazon, then ran it through the Cuttlebug. Then I used the Nestibilities with it also. 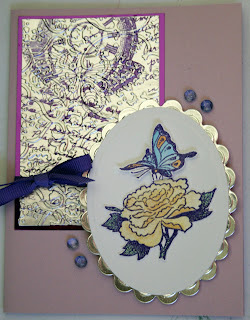 Other than the card base and ribbon everything is from Sparkle n Sprinkle. 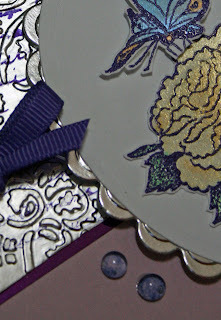 I stamped the main image with Versamark and embossed with Amethyst EP and colored with the new Pearlescent Watercolors. I cut out the flower and the butterfly putting the butterfly on a dimensional. 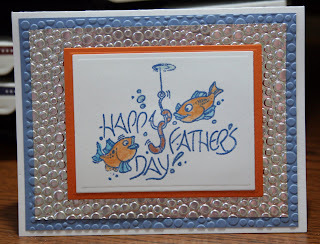 The Father's Day card is just the foil on cardstock. I embossed the image with Rhapsody EP. I also watercolored the fish with the Pearlescents, it's so shimmery. 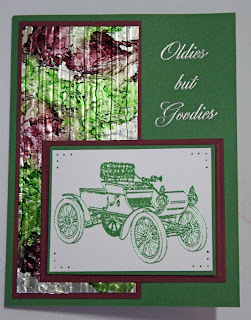 On the Oldie card I used the acohol inks and blending solution of the foil before I glued it to the cardstock and ran it through the cuttlebug. I really like the possibilities of this technique.